“The lack of overt branding on this brand is the branding.” -David Kroll, Head of Innovation for MillerCoors. No, seriously. This is real. MillerCoors is rolling out a new lager that is somehow aimed at the spirits-loving market. And that quote says it all. 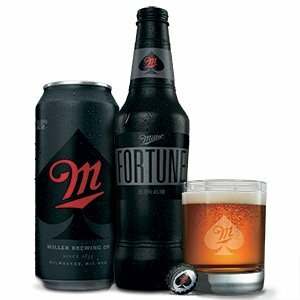 I’ll let you read the Bloomberg report about Miller Fortune for yourself, but basically MillerCoors wants you to pour this 6.9 percent ABV beer made with Cascade hops into a faux-bourbon glass and pretend it’s not beer. The marketing stiffs also go to great lengths to describe how the bottle shape stands out because it comes in an angular bottle designed to “evoke a guy in a tapered, athletic-cut suit,” according to the Bloomberg story. OK, just as long as there is no overt branding.They have even named the main character in a new TV ad blitz. His name? “The Motivator.” Pretty covert, guys. Well done. Tell me this: Does this beer taste good? Prove that to us, and we might be interested. Yeesh. Basically the marketing gurus will try anything to divert consumers attention away from the fact there products taste horrible. But man does this one go to a new low past the budweiser black crown of oh lets just color our beer darker and know one will notice it tastes exactly the same. Oh well, to each their own.